Big cities are renowned for pollution and, although not ideal, we accept the fumes from car exhausts, construction and noise as part and parcel of inner-city life. Our homes should be a place to escape pollution but, as recently mentioned in the Huffington Post, homes are full of hidden toxins, micro-bacteria and other harmful airborne particles. For most of us these go unnoticed, but for those with asthma, bronchitis or young children, it’s a serious issue. China is one of the world’s most polluted cities so it makes sense that our next product, the Xiaomi PM2.5 Smart Air Quality Monitor, was originally built for Chinese consumers. 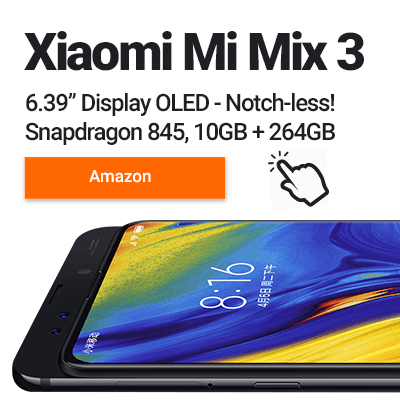 Xiaomi has become a household brand through their premium smartphone range but have expanded to include all things tech. 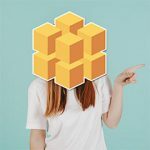 Typically, you can expect their products to feature state-of-the-art technology with high-quality manufacturing at a much cheaper price than the the western brands we’re used to. 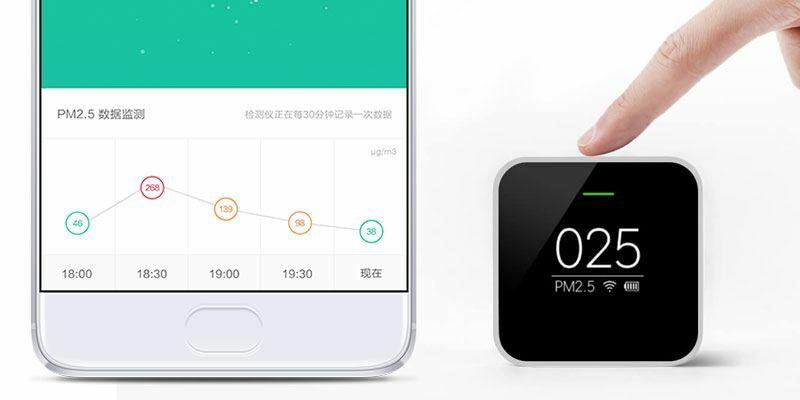 The smart quality air monitor has been designed in tandem with Xiaomi’s clean air purifier but can be operated independently as well or via the smartphone app. Today, we’re going to conduct an in-depth review of Xiaomi’s latest tech to bring you the low-down on just how good this product really is. The first positive impression you’ll find with this product comes from its looks. It’s wonderfully simple with its white outer casing, single button and a vivid black OLED screen. At first glance, it doesn’t look much different from an alarm clock and even comes with a clock mode built in. The modern appeal isn’t just confined to the appearance either, there’s some serious technical innovation going on behind the scenes. Until a few years ago, measuring air quality was a complex set of equations that was only achievable by much more complicated and bigger machinery. Xiaomi’s air quality monitor uses a laser to accurately measure the makeup of air in any given environment. It then displays this in a simple easy to digest format on the main screen. There are several different aspects it measures and users can access the full details via the app. 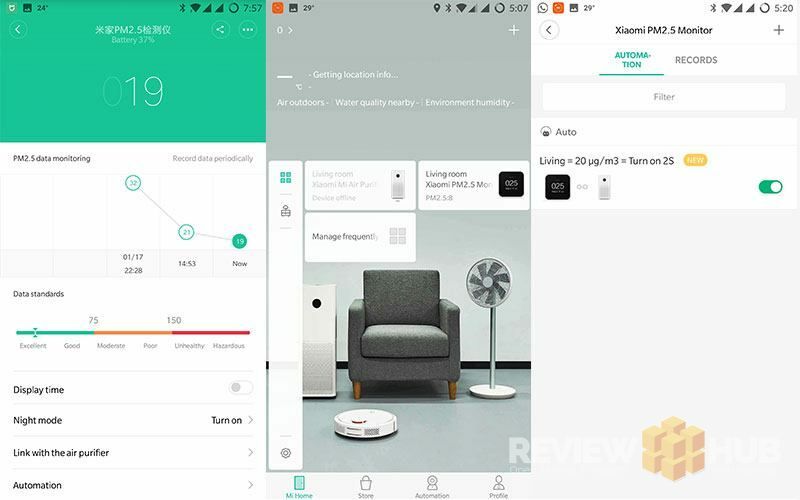 The interface of Xiaomi’s air quality app is what really makes this product stand-out. The information is provided in a way that is easy to read using visual features, like bar charts, as well as numbers. You can choose the most important details to be displayed on the screen of the device itself for up-to-the-minute spot checks. The data collected is stored which means you can pull up data history on how air quality has changed over time and whether or not improvements are being made. For those with respiratory issues, the Xiaomi air monitor can be linked to air filtration units and turn them on or off automatically based on real-time air quality reports; saving energy and money. Knowing when to turn your air purifier on and off, or whether you need to invest in an air purifier is best achieved using this product. The data is exceptionally accurate whilst the refresh rate for the on-screen display is just one second. Given the cutting edge technology on display, it’s rare to find a product like this at this price. All you need to use this unit is a WiFi connection. It’s small enough to fit in your pocket which means you can collect data from anywhere in your home, at work or in the surrounding neighbourhood. Fitting so much into such a small space is something that Xiaomi should be given credit for as it gives this product a universal appeal. So far, we’ve found a lot to like about this product. The only down-side I can see is that, for US based customers, it may be a little difficult to get in contact with the manufacturer should you have difficulty or problems with the device. Having said that, given the simple, easy to use interface alongside a sturdy build I don’t see this issue as being too much of a problem. This wouldn’t be much of a review unless we did some serious PM2.5 testing. 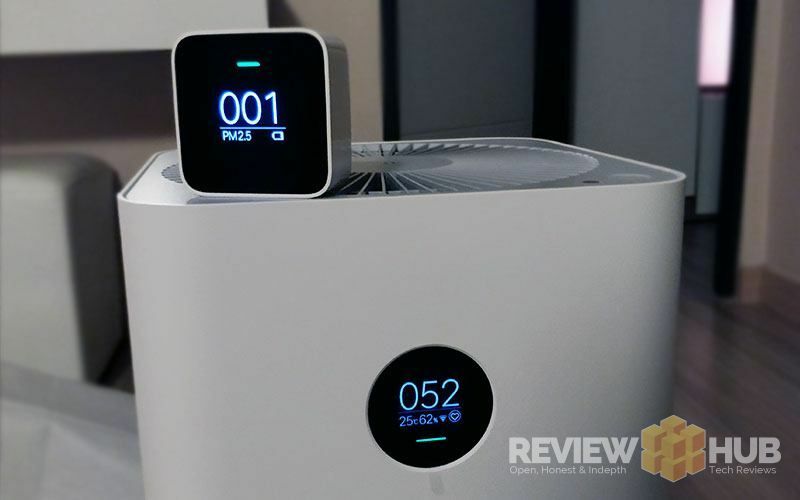 Luckily, I’ve also got the Xiaomi Mi Air Purifier 2S on hand to compare results with. The image above shows you the Portable PM2.5 monitor registering the air quality levels of air that’s already passed through the Xiaomi Purifier 2S. Polluted Air in… Clean air out! The Xiaomi PM2.5 monitor will work straight out of the box giving you readings straight away. To access the full functionality you’ll want to connect it to you WiFi network. Connecting was a big fiddly, you first need to download the Mi Home app then add your device. If you device doesn’t appear in the list, then you might have to change your region in the app settings. To get both the Mi Purifier 2S and the PM2.5 monitor to work I had to switch to mainland China. Don’t worry though, it’s still in English… well 99% is. Once connected you can see all the all air data in your home in an easy to read chart. After connecting successfully Xiaomi alerted me that there was a firmware upgrade for the Xiaomi PM2.5 monitor. It installed successfully and the PM2.5 readings post-update now matched the Air Purifier 2S exactly. 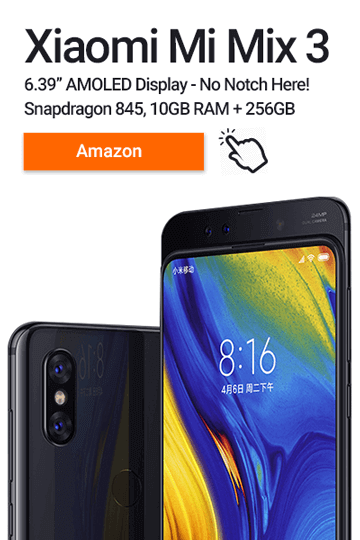 If you’ve owned Xiaomi products before then you’ll already know about their excellent buildquality and state-of-the-art technology. If you’re thinking about investing in an air purifier, this is the perfect product to help you decide first and then accompany it later. Just knowing the air quality around you is very important. As someone who spends a lot of time in South East Asia, being able to bring a portable air quality unit to the office brings me peace of mind. 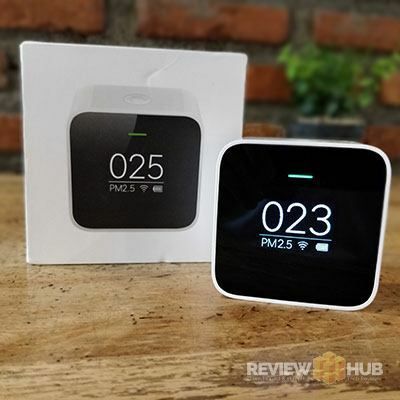 Do I recommend the Xiaomi Mi PM2.5 Air Quality Monitor? Yes, it’s a well design piece of the kit that comes with a super simple setup. 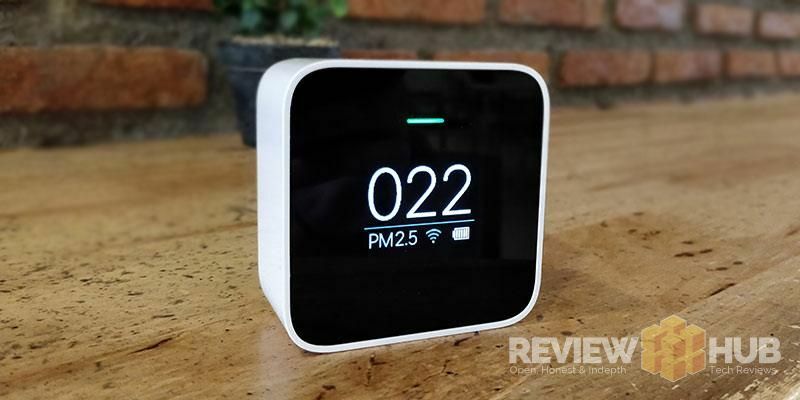 Has the Portable Xiaomi Air Quality Monitor tickled your tech buds?